Use a wheel and axle to move a large, heavy load. Find out how many barbarians it takes to move the load under different conditions. The radii of the wheel and the axle can be adjusted to help study mechanical advantage. Identify the parts of a wheel and axle. Understand that a wheel and axle is a simple machine that can reduce the force needed to move a load. Show that increasing the wheel radius decreases the effort needed to turn the wheel. Show that decreasing the axle radius also decreases the effort needed to turn the wheel. Observe the relationship between the effort it takes to move the wheel and the distance that the wheel is turned. 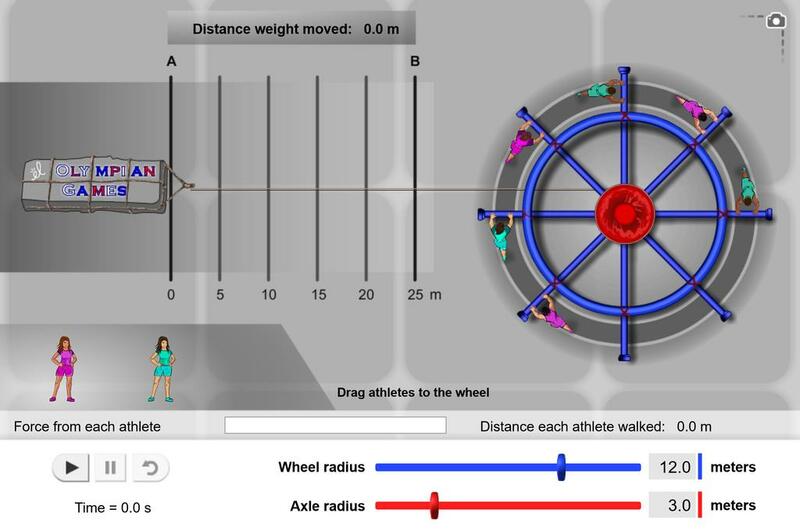 Calculate the approximate mechanical advantage of a wheel and axle. French translation for the Wheel and Axle activity, ideal for grade 8 science (Ontario).